Aerodynamic wingtip skids, originally of DG-500 series two seat gliders are made of two component very durable polymer PUR. 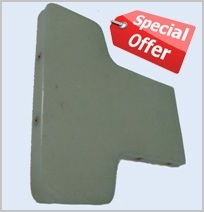 Aerodynamic wingtip skids, originally of DG-500 series two seat gliders are made of Aluminum. DG gliders standard trim weights are of 2.35 kg and of 2.2 kg. Trim weights are appropriate to fix inside the cockpits or in the engine departments of other airplanes to adjust their CofG's. Water bag 3 F 51 is of 65 liters, water bag 3 F 25b is of 95 liters. Consequently each wing tank holds 65 (glider water ballast maximum is of 130 liters) or 95 liters (glider water ballast maximum is of 190 liters). Winglets are for DG-300 ELAN and for DG-303 ELAN of all models. They improve named sailplanes performances at the high speeds and in thermaling.